I got Tyler when I he was about 7-8 months old in October of 1992. Tyler was probably born in February-April of 1992, but we don't know for sure. I picked him up out of the dumpster in south Minneapolis behind my friend Sarah's house. I asked Sarah if the cat had and owner and she checked around and found out he was homeless. I was surprised when I first got Tyler that he loved to ride in the car - most cats hate the car due to inner ear disturbances, the balance sensitivity that allows them to land on their feet gives them car-sickness. But Tyler didn't scream like the others and loved rides - I gave him the middle name of Toonces. Tyler Toonces Redwing! Tyler is one of those unflappable cats that love the veternarian, are good in the car, loves other cats and even dogs, and is kind of the boss around the house - he often bosses Guy and me! 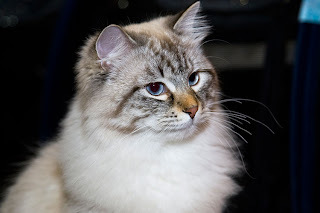 His calm and confident demeanor is unusual among cats and it make him "the king" of our little pride. Back in 1992, when I got Tyler - I soon realized that I had adopted a dumpster or "street" kitty. I was eating a tuna sandwich on the couch and watching T.V. when along came Tyler.... He slapped the sandwich out of my hand and ran off with it - swallowing as much sandwich as he could until I caught him. He was well schooled in "life on the streets" in Minneapolis and if you wanted some food you had to "GRAB IT". I laughed and once he figured out regular mealtimes he calmed down a bit. It should be noted that I knew Tyler before I even knew my husband, Guy. I owned Tyler for 2 months before Guy and I met. Despite this, Guy has bonded to Tyler incredibly over the years - he has truly adopted him has his own (who adopted who is up in the air). 2) he had a sweet tooth and went nuts for anything sweet - I think that is because sweet things would rot less in dumpsters so he probably ate that first...? 3) He has always been a cuddler. He loves to be held, snuggled, kissed, petted - any type of attention is fine with him. He lets Kaylee (Shih Tzu) lick his face and ears! He doesn't do the first 2 items anymore because of his advanced age - although he is great at still coming when you call him. He is almost like a dog that way - very obedient. Last summer, June 30th, 2008 - the moment Janis, Grayson and Greta came in the house Tyler let loose his bladder and bowels and vomited all at the same time. He then staggered around and seemed really confused and started panting heavily (it was 68 degrees in the house so that panting was part of the stroke-thing.) He went down by the furnace and we thought - omigosh, this is it he's dying right now. We tended to Janis, Grayson and Greta and over the next few days he returned to normal. Weird. How old is Tyler in Human Years? 1) Allow 15 human years for the first year of your cat's life. 2) Add nine years for the second year. A two-year old cat will approximate 24 human years. 3) Add four human years each for successive years of his life. Total = Using this math Tyler is 84 years old! Yep - he is the sweet, old King of our Jungle.